As some of you may know, I am really into skincare. 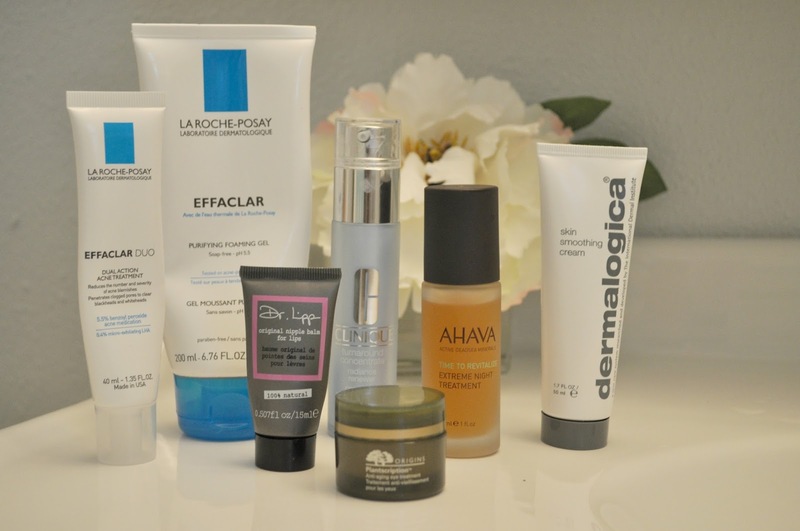 Ever since I got my first job 10 years ago, I started buying skincare products, so I have tried my share of products to this day, I have a lot of favorites and there is still so much I want to try. I have tried a ton of different makeup removers and wipes and this is so far my favorite and it is available in almost every store. I have been using the same cleanser for over a year now. I love it so much, I have lost count on how many tubes I have gone through. Cleans wonderfully and I can use it with my clarisonic without the foam getting in my eyes and nose. This is a new one for me, I bought it because of all the reviews, so even though I am not a lover of Clinique, I decided to try it out. I have been using it for about 3 weeks now and like it a lot. I have noticed that my skin seems clearer and my dark spots are disappearing. I have used last year, then I ran out and since it is so spendy, I didn't rush back to get it. Then I noticed fine lines emerging on my forehead. So I bought this again and it is like my skin drinks it up. I put it on at night before bed, the fine lines are slowly softening up. This is my HG item. I now know that I need it. If you sign up for emails from AHAVA, they occasionally send coupon codes, so I was able to snag this for 40% off. This cream smoothes and softens skin without feeling heavy, I put it on top of my serum day and night. A little goes a long way. This is a new one for me, I have used it for about 2 weeks. I have been using eye cream twice a day for the past 10 years, so I have tried many different eye creams, this one keeps my under eye area moisturized, and it does not sting my eyes and feels lightweight. I have used many spot treatments and this one is one of the best. It does the job without drying out my face. I always put something on my lips, otherwise they get dry. This is a bit pricy, but lasts a long time. I use it sparingly day and night and it keeps my lips moist and soft.